May19 by Steven Birchfield A.M.A. One has to practice the classical concepts to understand their significance in real terms. Aversion is not a “corruption” of the planet. It is rather a weakness. We must examine the distinctions; what is the difference between “weakness” and “misfortune and corruption”? One thing I have noticed in my studies and practice is that the ancients made clear distinctions between the quantity of the signification produced and its quality. These terms would seem somewhat self-evident; however, it is common to find these terms erroneously mixed. In the simplest terms, quality tells us what kind and quantity tells us how much. Abu Ma’shār for example in his Introduction to Astrology makes this distinction between quality and quantity. The fourth chapter, on the good fortune of the planets, their power, their weakness and their misfortune . . . Here the astrologer is outlining two distinct categories of evaluation. One is the fortunes and misfortunes. This is his qualitative judgement of what kind. The other is of the power and weakness of the planets, which is a quantitative judgment of how much. Let me try to explain this in another way. Electricity has a remarkably accurate analogy to astrology. The principles of electricity involve different factors that produce an effect. Voltage (V) is like the essential dignity of a planet. It describes the quality. There are several type quality batteries. You have 24V, 12V, 9V, etc. where the voltage describes the quality. Then you have current or amperes (A) that directly influence the output or effect. This is analogous of a planets phase to the Sun, or if it is in the chart sect or not etc. The effect of that battery [or planet] is its ability to use its full potential, i.e. seen as the light from a light bulb that is attached [effect or Watts]. A 12V battery with a current of 65 amperes (a typical car battery) will produce 780 Watts (voltage x amperes = watts). That is its effect. Likewise a planet in its domicile (the 12V battery), oriental of the Sun (if a superior planet), and in sect (the optimal 65A current) produces an optimal effect (Watts) that we determine from the essential nature and determination of the planet. The normal car is the “domain” of that battery, designed specifically for that environment and its demands. If I take that same 12V, 65A battery and place it into a different environment like a diesel truck, it may produce enough to perform once but the strain placed by the higher demands of the environment will immediately corrupt and ruin the battery. A diesel truck may require a 24V 85A (2040 W) battery for example. This is similar to a planet posited in a sign where it is peregrine, or in a sign that happens to be its detriment or fall. If we place on that 12V battery resistance in the form of lights or a heater, that resistance (or impediment) is measured in ohms (Ώ). The introduction of a new factor changes the total effect. If the light produces a resistance of 3 ohms then the total effect is now calculated Voltage/Ohms x Amperes = Watts (effect). In our example then the voltage, 12V, is divided by the resistance, 3 ohms, and multiplied by the amperes = 12V/3Ώ x 65A = 4 x 65 = 260 W. You can see the significant reduction compared to the original potential of 780 watts. This is how various factors impede a planet, i.e. joined to a malefic. This is resistance. None of these extra factors changes the essential dignity of the battery. It is always a 12V battery. Changing either the current or resistance, however, will change the effect. If the current [amperes] is reduced or increased, the effect will be either stronger or weaker not its dignity. If we increase the resistance [ohms], it also reduces the effect because its quality is directly affected. Neither current nor resistance is the same as voltage! These are three individual and distinct variables! Now as long as that battery is full (like a car battery is charged by the regulator and generator of a car), then its effect is constant, meaning that it can produce 100% of its effect at all times (like an angular planet). If that battery should have an under specified alternator or generator with perhaps dirty brushes it does not keep the batter properly charged, its effect is less constant and somewhat weaker (like a succedent planet). If the alternator/generator is defective and producing far below the specific requirement then the battery eventually will empty itself of charge and it may not even start the car consistently or barely cause the motor to turn over (like falling cadent). This measurement has nothing to do with essential dignity because the battery is still a 12V battery, but rather it is a measure of how much of the quality (12V) is available to be transmitted and how constant. Just as a battery that is flat can be “jumped”, so can the planets. If I series connect another fully charged 12V battery to the flat battery then that flat battery will produce consistently enough to be useful. This is much like what happens if you have a cadent planet that is aspected by its ruler or a benefic from a trine aspect in an angle! What I am trying to illustrate is that many things that are often called essential dignities, are not in themselves essential dignity. Current (amperes) and resistance (ohms) is not the same thing as the quality of the source (voltage or its essential dignity). It is all three of them together that determine an outcome or effect (Watts) and the effect is not the same as dignity! The judgement of the planets is a science and cannot effectively be boiled down to a simple table because these factors are each the function of a variable. While Voltage (quality) and Amperes (quantity) both affect the outcome (Watts), the relationship of quantity has a very special role. If you consider the equation for the outcome, we find that the misfortunes and corruptions directly affect the quality and not simply by ‘subtraction’ – it divides. It does not affect the means or quantity! These are some very real variables that have a specific result. Now all of this is a very simplified analogy since there are many variables that determine both quality and quantity. In the case of aversion, it affects the rulers’ ability to produce an effect for the particular domicile it falls in aversion to! It is not a ‘joy’ in the sense the ancients used but it is a condition that has a direct effect on the domicile and the resultant house it rules! chart of ex-tennis star Jimmy Connors. 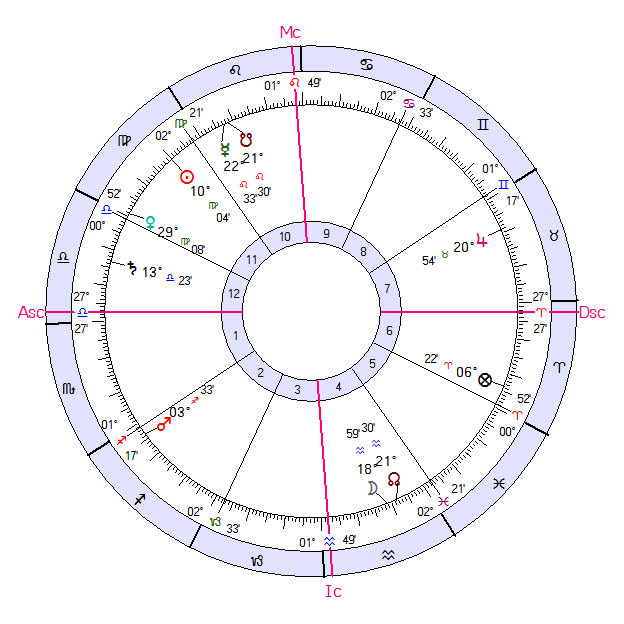 The Sun in the 11th is a strong position for the Sun in this diurnal chart! It does indicate reputation and success. However, that reputation and success is marred by separation, controversy and exile (this is what Paulus tells us a planet in aversion to its domicile signifies). Moreover, Lilly following the ancients tells us that a planet falling cadent of its domicile, so that it does not behold it, is indicative that the planet is “ill-disposed” to signify those matters. Based on that signification, I would have to say that while this native receives reputation and success in his profession, there is some aspect of that which brings him into controversy and even exile by his peers and professional associates. The Sun, ruler of the 10th, is in the 11th in aversion to Mercury ruler of the 11th in the 10th! At some point in this natives’ profession he is perhaps in exile to his professional peers because of controversy. Connors was denied a shot at the Grand Slam because he was banned from the French Open that year after signing to play in World Team Tennis. Because the Association of Tennis Pros (which Connors refused to join) and the French officials opposed WTT, the entries of WTT players were refused. These significations are not some intangible potential, but actually signify real people, things and events! It is also interesting to see that this ban and exile came during his Mercury Firdar when Saturn (exalted ruler of the 12th and 1st) was the participating distributer! So to say that just because a planet falls in aversion to one domicile but not the other is not an impediment is quite untrue! As I said before the consequences concern the house to which it is in aversion and if that house is normally a profitable house to the native, it can often have some dire consequences to the outcome!